Ah yes, the bed and breakfast: A remarkable time for people of all ages. As the world transforms into a sharing economy, it’s a wonder what hotels and bed and breakfasts are to do. However, the bed and breakfast industry has remained strong, seeing as how people who seek out these establishments are more interested in the intimate surroundings, cozy decor, and people who are willing to make them food, talk to them about the area, and make them feel welcome. Bed and breakfasts have been around for quite some time, so there’s no doubt many of them already have websites to promote services and accommodations. However, if your organization needs a website revamp, or you haven’t had the chance to build a website in the past, now is the time to get started. After all, building a website is far easier than it used to be, and most people are going to find booking information about your bed and breakfast by taking out their phone and searching on Google. 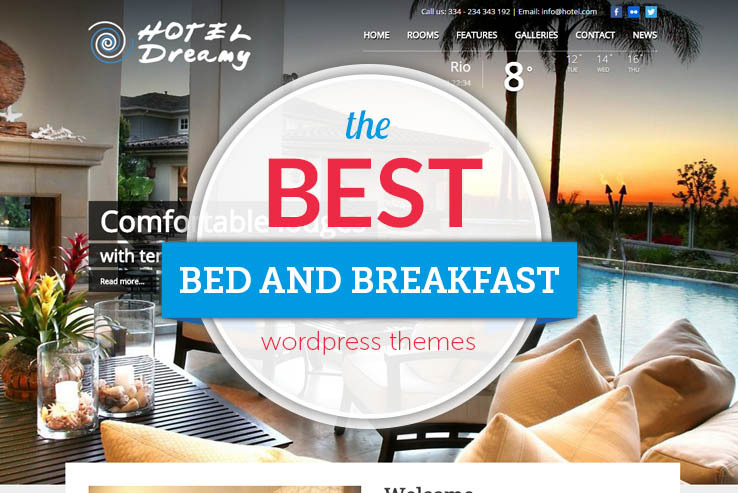 Seeing as how a website is pretty much a must-have nowadays, what are some of the elements you should look for when seeking out a bed and breakfast WordPress theme? Plenty of bed and breakfast themes are available for you to choose from, so we narrowed them down for you. To start, the best options have booking modules so you don’t have to constantly sit on the phone bringing in reservations. Also, service and amenity information is ideal for showing people what you have to offer when they come. In addition, it’s not a bad idea to include galleries with images. That way, customers have an idea of what the scenery looks like around the bed and breakfast, along with how big and appealing the rooms are. The themes listed below are the best of the best, so keep reading to learn more about them and to test out the demos. 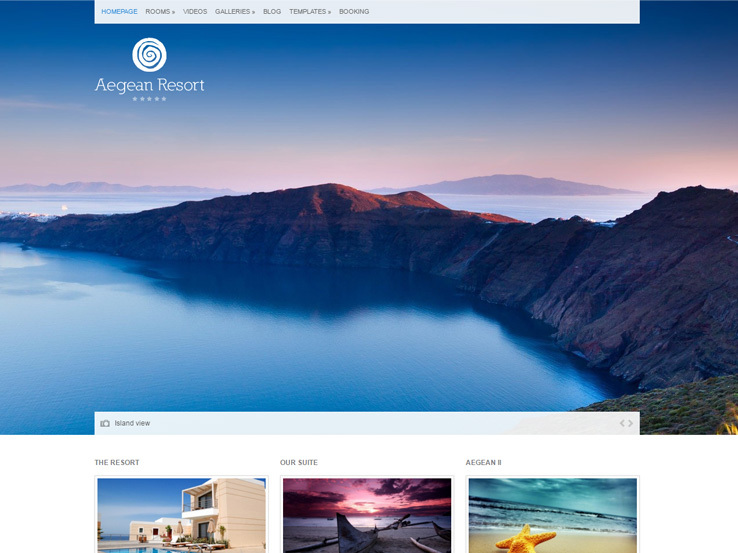 Starting out with the Aegean Resort WordPress theme, you can launch your website in style by selecting a beautiful theme with responsive media elements and various tools for booking and getting people to stay at your bed and breakfast. As stated before, customers can go to your site and see a wonderful layout on all types of devices and it includes a weather widget, which comes in handy for those users who are debating on whether or not they should come to the area during a certain time period. The booking form sits right on the theme’s homepage, but you have the chance to share it on just about any page throughout the site. It asks what time the customer is coming, along with details for rooms, the number of people coming, and more. The best part about the booking form is that it cuts down on the amount of people that call you on the phone. All of the booking management is done on the backend. Four content types are included with the Aegean Resort theme, so you can display information in an organized fashion on the homepage. One of the content types is for showcasing all of your rooms, including the details about those rooms. You may upload images about an ocean view villa, with information about what amenities come along with this type of room. Obviously, people will want to see descriptions and images before booking, so make sure you accommodate them. Galleries, slides, and videos are the other content types, bringing together a wonderful combination of media options. If you would like to share a promotional video or include a spot where you feature customer photographs, all of this is available through the Aegean Resort theme. We enjoy the homepage, because the slider is huge, taking up the majority of the screen. Along with translation optimization, lots of widgets, an email subscribe form, and social media buttons, the Aegean Resort theme is one of the best options for bed and breakfasts. 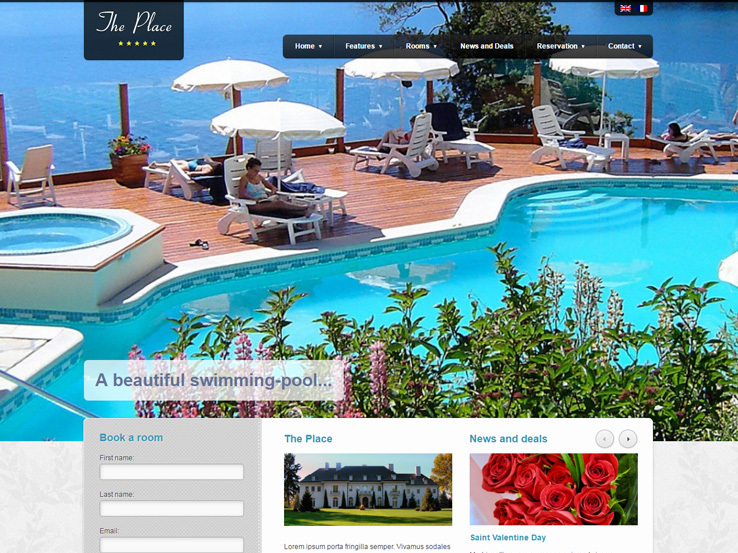 The Place WordPress theme has a unique and creative design, with a responsive layout that makes it much easier for people to quickly pull out their phones and make a reservation at your bed and breakfast if they want. Since more and more people prefer using their phones and tablets anyway, it only makes sense to implement this functionality on your website. The Place WordPress theme provides unlimited colors and backgrounds, both of which help you integrate your own brand. Change the colors and backgrounds from the backend of your website and use the translation files to translate your website into another language. The powerful admin panel is where you can locate the majority of settings to make cool stuff like this happen. In fact, the most important area to be managed is the booking panel. The booking panel sits to the left-hand side of the homepage and it asks for a few bits of information from the user. You can add your first and last name, along with email, room type, check-in date, and check-out date. All of these details are managed on your WordPress dashboard, cutting out any programs you would have to work with and minimizing the amount of time you’ll have to spend on the phone. Along with that, the majority of the Place homepage is constructed with widgets, turning it into somewhat of a drag-and-drop interface. You can implement a beautiful gallery with thumbnail image links to larger pictures of your room. In addition to that, social media buttons are placed anywhere on your site, depending on how large you would like them and when you think people would like to see them first. A slider is included towards the top of the header, supporting high-resolution images and prompting people to click elsewhere with call-to-action text with the possibility of linking to other pages. Overall, the Place theme is a solid choice for bed and breakfast businesses, so give it a try and let us know what you think. Bellevue is a favorite of ours because it has seven demos that all look a little different. This way, you won’t have a website that looks exactly like all of the other companies that choose the same template. In addition to that, WooCommerce integrates flawlessly with the Bellevue theme, providing the ultimate eCommerce platforms for your company. Since bed and breakfasts are likely to sell some merchandise, WooCommerce helps out quite a bit with that. It also ensures that you can collect payments for bookings directly through the website. The WP Booking System plugin is a premium plugin that you would generally have to pay for. 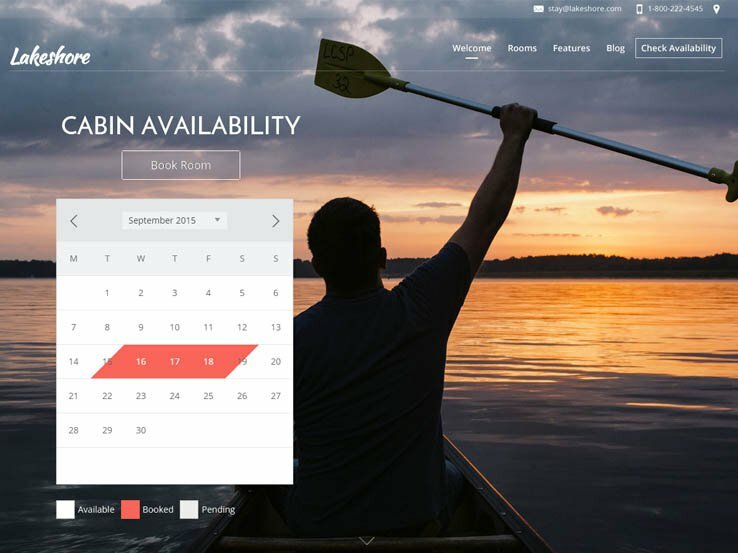 However, if you go with the Bellevue theme, simply install the theme and you gain access to the beautiful booking module. Along with that, there’s a MasterSlider plugin which features call-to-action text, high-resolution image support, and lots of buttons and animations to play around with. Think about how many people you could convince to buy a room or check out your merchandise with the help of call-to-action spots. Tons of Photoshop files are included with your purchase, allowing more advanced designers who are looking to really customize the overall look. The translation files are ideal for the bed and breakfast businesses out there, considering lots of people are going to come to your establishment from all over the world. Your best bet is to cater to people from all backgrounds and this means allowing for them to read information about your bed and breakfast in their language. Each demo has some sort of take on the booking module, with calendars and fields for entering details about what customers want. Contact information is generally listed towards the top of the homepage and the blog can be accessed with the simple click of a button. Shortcodes are great for modifying typography and implementing simple design modules. A shortcode keeps your hands out of the HTML and CSS, allowing you to simply copy a line of text to where you want an element like a button or a column to appear. 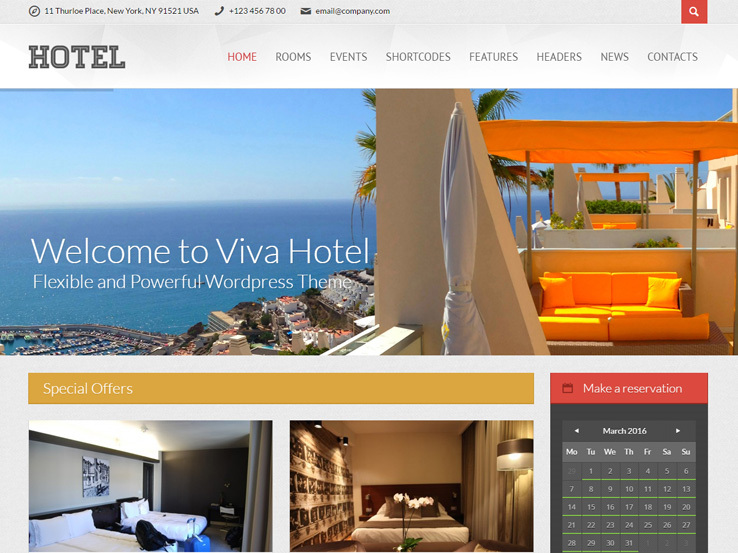 Try out the Viva Hotel theme if you want a more playful take on the bed and breakfast theme. This responsive theme includes a reservation form, unlimited sidebars, and over 100 Google Fonts. Typography is a breeze, and you even get an events calendar for sharing what patrons can expect in the future. The custom widgets are huge for quick design and the header supports high-resolution images. Geared more towards small hotel owners, HotelEngine has everything you need to make an impression and create brand recognition. Use the full-screen header image at the top to show your hotel or replace it with the slider to showcase the surrounding area and the inside of your hotel. Wow potential guests with multiple galleries and feature testimonials right below the slider to build trust. Make it easy to book a room with integrated booking form or add bookings manually. 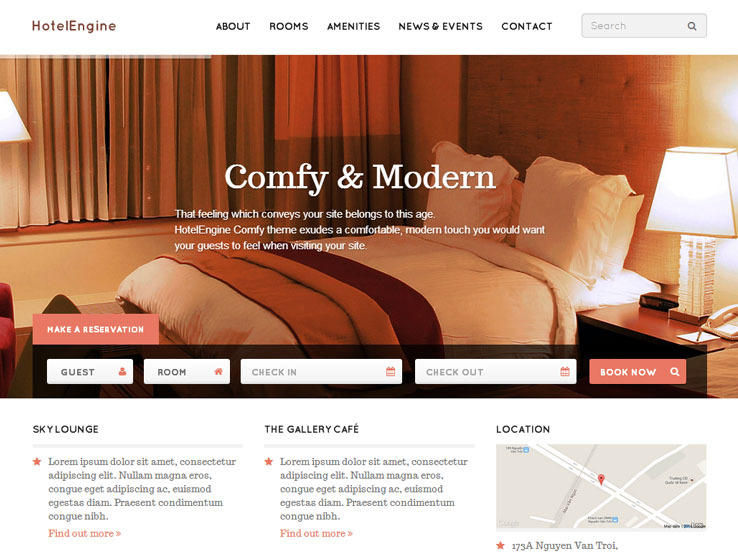 HotelEngine will not disappoint when it comes to customization options either. Everything can be tweaked to your liking to create the unified look. You can create custom color schemes, upload your logo, connect your social media profiles, and much more from the admin panel. Google Rich Snippets settings can be controlled from the backend as well which means you have the opportunity to boost your search engine rankings. On top of it all, HotelEngine has a responsive design which looks good no matter which device or browser your guests are using. CountryHolidays is an ideal choice for country hotels, accommodations, and bed and breakfasts. The homepage comes in two variations: a version with a full-screen header featuring a slider or a background video and a version with a full-screen header featuring a booking form. You can also display a coming soon page if you’re still in the launch stage. This way you can build your audience even before your grand opening. Right below the header, you can showcase the best features your accommodation has to offer and further down the page there is plenty of room to showcase your rooms. 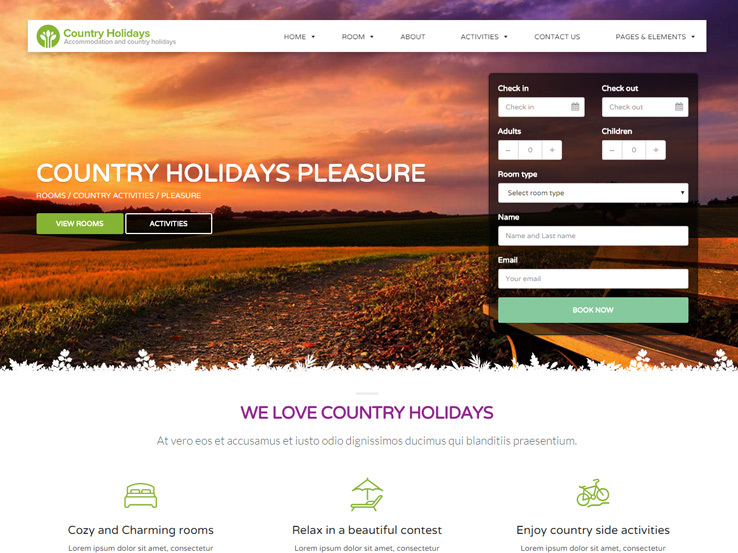 CountryHolidays is fully responsive and fully customizable. Powered by Visual Composer Builder, you can easily modify existing layouts and create new ones. Colors, fonts, and more can be changed from the theme options panel. The theme also integrates with MegaMenu plugin allowing you to add all the important pages to your navigation without overwhelming your users. On top of that, you can easily get a head start on building your website thanks to one-click demo import. The Hotel theme comes with a powerful booking module, customer reviews and testimonials for social proof, an events manager, and beautiful banners and sliders to showcase images of your hotel and food. It also features a rooms section for publishing room details, complete with reviews, comments, galleries, and pricing plans. People can easily get in touch with you thanks to the included contact form, and there’s also a newsletter subscription module to capture email addresses. Social media integration helps get the word out about your hotel, and you can also display your Instagram feed on your site. Besides, you’ll find several layouts to choose from and a drag-and-drop page builder to easily create your own custom layouts, hundreds of fonts, and unlimited color options to help with your branding. 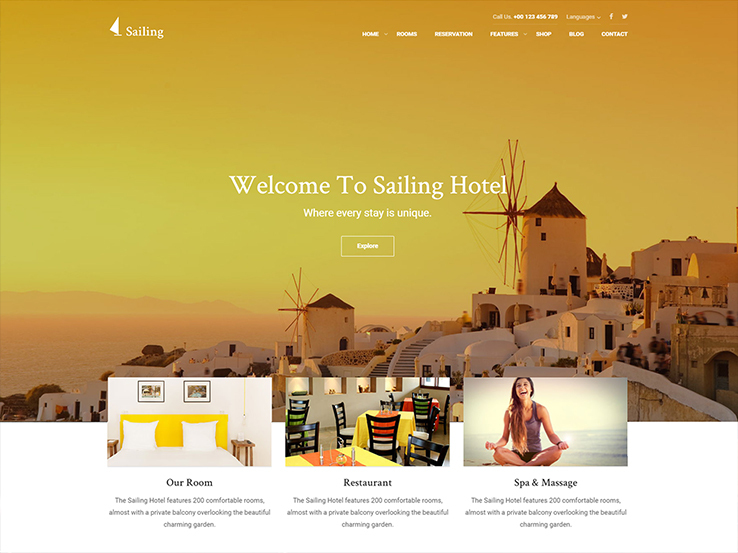 Meet Sailing, a clean and elegant WordPress theme for hotels. It offers an excellent reservations system that features room, customer, coupon and pricing plans management. It also allows you to add extra packages and block particular dates. Showcase photos of your hotel and foods using the attractive slideshows, carousels, and image banners. The template comes with a wide range of ready-made layouts to choose from and you can also create your own custom layouts using a drag-and-drop page builder. Furthermore, it integrates with MailChimp so you can easily get started with email marketing, while the Contact Form 7 plugin makes it easy for people to get in touch. Also, there’s social media integration, translation tools, eCommerce support, and unlimited customization options to make the theme your own. 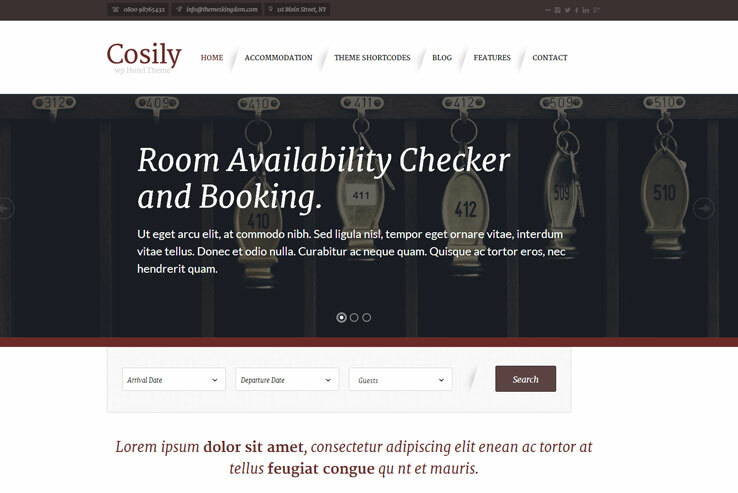 Cosily is an elegant theme built with your guests in mind. 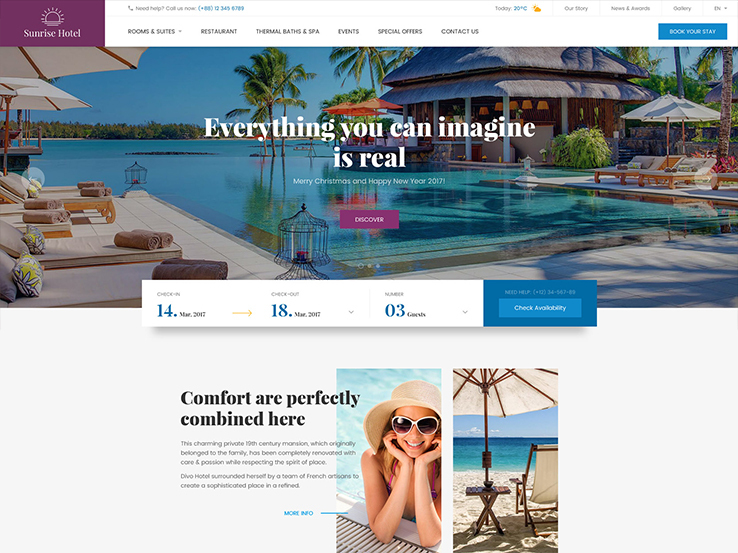 The gorgeous full-width slider at the top is an attention-grabber, allowing you to draw potential guests in and give them a glimpse of your resort. The search from right below the slider provides an easy way to search for available rooms and it’s just as easy to book a room straight from the results page or learning more about the chosen room. The gallery below and the testimonials are yet another way to build trust and establish a connection between you and your future guests. Cosily may look simple but the elegant design is just the tip of the iceberg. There’s plenty of features behind the scenes which allow you to build the perfect website for your bed & breakfast or a resort. The theme is fully responsive and the layout can be customized with various widgets and shortcodes. Your location can be easily displayed with Google Maps and Cosily integrates seamlessly with Contact Form 7 to provide an easy way of getting in touch with you. This theme is a great choice for making that first impression count.